Well it's overly fatalistic but it does suggest the fact that we have a political class which runs society along lines which are alien to most of the population. this was a Simpsons Episode: Treehouse of horrors VII. Interesting that there should be such a divide between the State and the Nation. More paranoid nonsense from Leunig I'd say. Google searching for some of the more popular aliens-amongst-us reptilian theories would return similar stories. 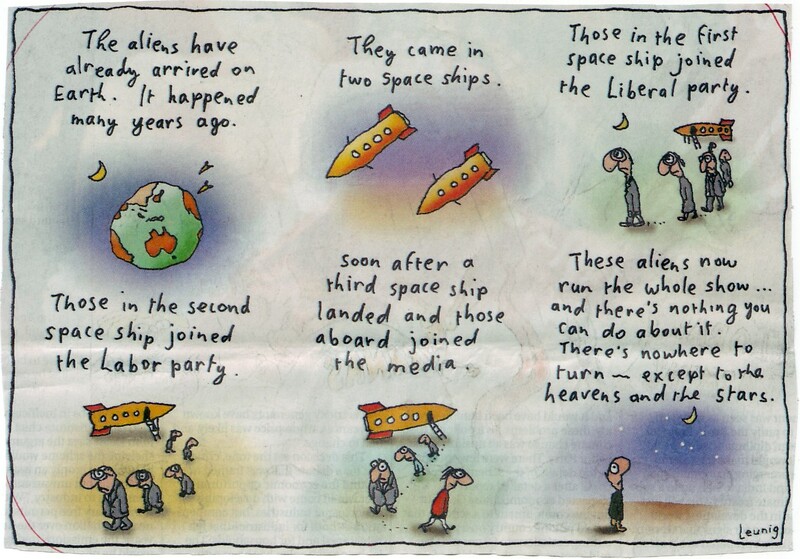 I believe Leunig went through a terrible divorce in which he lost almost everything. Strange that he remains a liberal. What a knob. I find that his, er... comics (or whatever you may want to call them) are imbued with the loss of childlike innocence, but often it comes across like childish naivete... or sometimes, like in this example, just plain stupidity. In other words, nothing extraordinary for a liberal.